The Mountains of Virunga where the Volcanoes National Park is located shelters these two ancient apes of which mountain gorillas are critically endangered while the golden monkeys are listed as endangered on the red list of IUCN. Tracking these two primate species in three (3) days only which include arrival and departure presents a perfect short Rwanda safari that generates lifetime memories. The 3 Days Gorilla Safari in Africa & Golden Monkey Tracking in Volcanoes National Park starts and ends in Kigali Rwanda and offers you accommodation options of the Luxury lodge like Mount Gorilla View Lodge, Midrange Lodge like the La Palme Hotel and the Budget Lodge like the Muhabura Hotel but still maintaining an opening for the traveller to choose a lodge of his / her choice in a range of lodges in Volcanoes National Park. The walk to the twin lakes offers impressive scenic views of the lakes in the mountain shadows. After breakfast, Muleni Safaris Uganda Tour guide will meet with you to discuss the days program and then effect a transfer to the headquarters for briefing by park officials at 8am. Requirements like firm walking shoes, hut, insect repellent, sun screen, rain gears, packed lunch and bottled water are a must plus other tools that one may need once in the tropical rain forest. The gorilla trekking experience in Volcanoes is beyond gorilla alone. The sights of the Volcanic Mountains that stretch from Congo through Rwanda to Uganda, the verdant green vegetation that shelter their slopes, the counts of birds along with fauna like duikers and buffaloes combine to generate lasting safari memories. 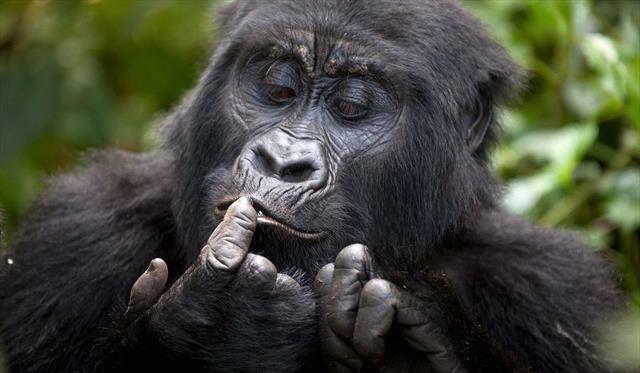 The gorilla trekking activity tends to last from 2 to 8 hours or more depending on the day’s gorilla movement. The one hour of direct encounter with the gorillas brings you closer to these ancient apes, look into their eyes, their gigantic structure that makes them most powerful of all apes. In the afternoon, you embark on the hike / walk to the twin lakes of Ruhondo and Bulera offering magical scenic views. The adjoining lakes in the shadows of the eight mountain chain of the Virunga Volcanoes feature a thrilling boat which you can optionally engage yourself in to interact with the local fishermen gain more views of the lakes and Islands. The walk offers you sights of birds and the views of the Volcanoes. An extension to Russumo falls can be undertaken too. Retire from the activity back to the lodge for relaxation, dinner and overnight. After breakfast, Muleni Safaris Uganda Tour Guide will brief you with the days program and then transfer you to the Park headquarters for another briefng from the park head ranger. You will then head to the trail and embark on the search for the golden monkeys that tend to dwell in the Bamboo Zone. The golden monkey tracking experience tends to last 4 hours and this includes one full hour on direct viewing. It is an exciting experience as you explore this golden backed monkeys jumping from stem to stem of the Bamboo and playing hide and seek games. You retreat from the encounter and embark on the transfer to Kigali 116km about 2 – 3 hours’ drive to catch up with your evening flight departure back home.